Logins this hour: 28813 ? 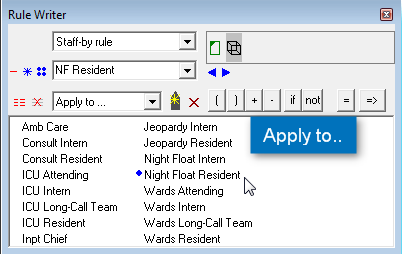 Create a staff-by rule if you need to define who's available to take call or cover a shift beyond OnCall's standard filters, work preferences and day-after rules. 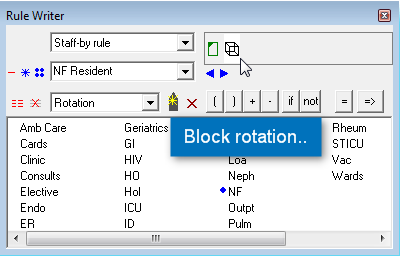 The Rule Writer toolbox has three dropdowns. In the top dropdown, select Staff-by rule. 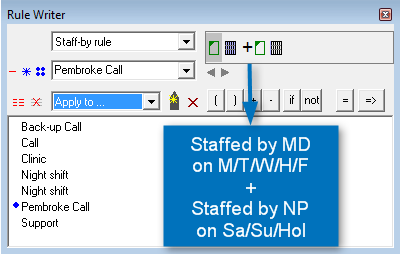 When finished building the rule, click the Apply to icon, => to apply the rule to one or more call services or shifts. 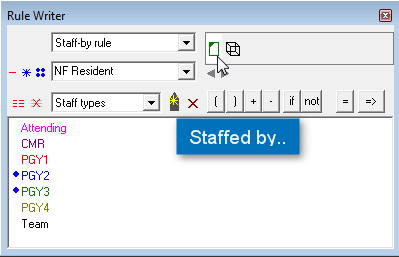 If you successfully applied the rule to the correct service or shift, the service's Infobox window displays a box that begins with "Staff rule" followed by the rule name. 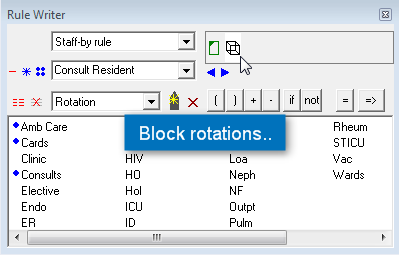 A call service is staffed by a combination of block rotations. In this example, the Consult Resident service is staffed by PGY2 and PGY3 residents that are on the Amb Care, Card, and Consult block rotations. A re-purposed call service is providing an inaccurate Team summary list. 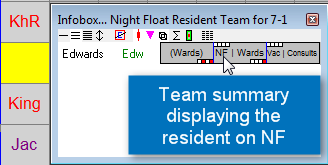 In this example, the Ward call service row was renamed to Night Float Resident. 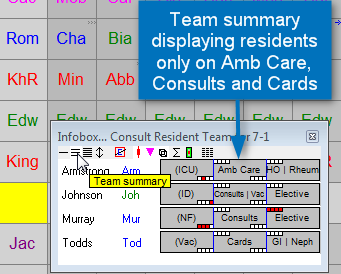 The Team summary list is still providing names of residents on Wards block rotation. It is supposed to be staffed by PGY2 and PGY3 residents that are on the NF block rotation. The Call service is only staffed by an MD if nobody is on Back-up Call that day. A staff type cannot work another service if already scheduled that day. 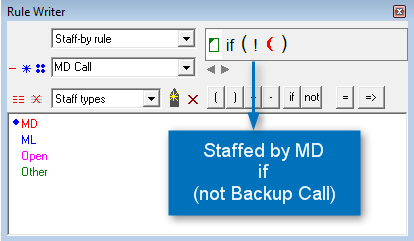 In this example, Back-up Call is staffed by MDs and NPs. But if an NP is working Call that day, an MD must work Back-up. Two different staff types can work the service on different days of the week. In this example, Pembroke Call is staffed by MDs Monday - Friday and NPs Saturday, Sunday and Holidays. Click on the service or shift name on the left-hand side of schedule. 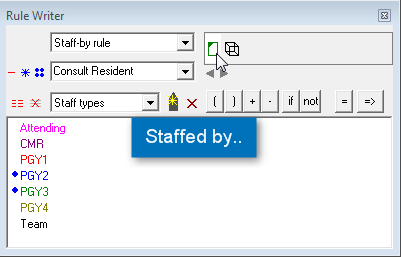 In the Infobox window, click the box beginning with "Staff rule" followed by the rule name. The Rule Writer toolbox opens to the rule. Click on the rule's condition icons on the top-right side of the window to edit the entries. 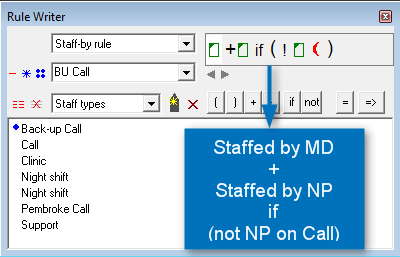 Click on the Apply to => icon to edit which call services or shifts follow the rule. A Staff-by rule can handle the most advanced staffing rules. If further assistance is needed, please email Amion support or call (888) 898-0779 ext. 2. Here we discuss rule. This page describes staff.